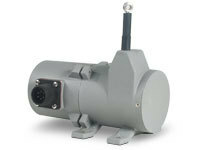 The PT8420 with its 4-20 mA feedback signal is ideal for monitoring the stroke of a hydraulic cylinder and other applications requiring position data acquisition in harsh environments. As a member of our family of NEMA 4-rated cable-extension transducers, the PT8420 provides a feedback signal that is proportional to the linear movement of a traveling stain- less-steel extension cable. Simply mount the body of the transducer to a fixed surface and attach the extension cable to the moving object.